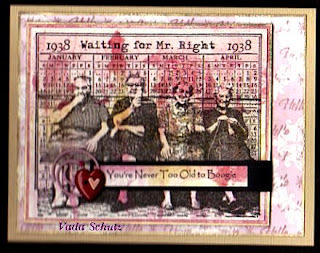 Vada's Blog Stamp Inks and Paper : Waiting for Mr. Right. I needed a Q & E Birthday card for a Dear Stampin’ Friend, and what better than a funny birthday card. When I came across this image from Lost Coast Design, I knew it was perfect for Barb. So from June 2006 newsletter, Watercolor Roll and Antiqued Glimmers, from Dec 09, we have a fun birthday card. Stamp credits are; Background “Hello” is from Hero Arts, Embossed image is from CTMH. Mr. Right from Lost Coast Designs, and To Old to Boogie is from Rosie’s Roadshow. Hi Vada, had to pop over and see who makes this stamp. too cool!